JOHN DEMPCY is a recipient of a 2018-2019 Pollock-Krasner Foundation grant to support the creation of new work. The Pollock-Krasner Foundation, Inc. was established in 1985 through the generosity of the late Lee Krasner, a leading abstract expressionist painter and widow of Jackson Pollock. Since its inception the Foundation has awarded over four thousand grants to artists in 77 countries. GARY GROVES’ work was selected for inclusion in the International Print Center’s exhibition in New York titled Forms of Enclosure – New Prints 2019/Winter. The exhibition showed from January 17 through March 23, 2019. For more info, see ipcny.org/formsofenclosure. Recent artwork by SHARON BRONZAN and GEORGE JOHANSON is included in Visual Magic: An Oregon Invitational, an exhibition at the Jordan Schnitzer Museum of Art in Eugene showing from January 19 through May 12, 2019. Curated by Danielle Knapp, the exhibition includes recent work by forty-five artists who began their creative careers in Oregon during the 1960s and ’70s and who continue to create art that inspires and expands Oregon’s artistic landscape. A catalog of the exhibition is available. RITA ROBILLARD is one of six northwest artists featured in Forest Visions, a high-profile contemporary art exhibit on display from April 1 through May 9 at Clatsop Community College’s Royal Nebeker Art Gallery located at 1799 Lexington Avenue, Astoria, OR. A community reception will be held on Thursday, April 11 at 6:00 p.m. Curator Bonnie Laing-Malcolmson has assembled a stellar cast of northwest artists for the exhibit, including Astoria photographer Robert Adams, as well as painters Kim Osgood, Laura Ross Paul, Michael Brophy, Rita Robillard, and sculptor Lee Imonen. NAOMI SHIGETA, TALLMADGE DOYLE and GARY GROVES are among 57 artists from across the United States selected for inclusion in Whatcom Museum’s biennial exhibition in Bellingham, WA. The exhibition runs from February 2 through May 19, 2019. This is the third biennial showing of Bellingham National and this year’s theme is Water’s Edge: Landscapes for Today. The exhibition will be showing at the Lightcatcher building and was juried by Bruce Guenther. For more info, visit www.whatcommuseum.org. JAMES MINDEN’s work was featured in a summer 2018 group show in New York City at the Muriel Guepin Gallery. Abstract Mania included works by 6 other gallery artists. The gallery’s new location is at 158 Lafayette Street in Manhattan. The Guepin Gallery also featured MINDEN’s work, along with other artists’ works, at the Seattle Art Fair from August 2–5, 2018. JIM RISWOLD had a summer-long retrospective exhibition of his work at Hallie Ford Museum of Art at Willamette University in Salem. The exhibition, titled Jim Riswold: Undignified ran from June 2 through August 26th, 2018 with monthly gallery talks on June 12, July 10 and August 14. JAMES MINDEN participated in the Portland Winter Light Festival on Friday, February 2, 2018 from 6–10 pm. Viewers were invited to join him outside and inside Studio #7 at 211 SE Madison (East Creative) for this initial showing of his largest-ever hologram hybrid painting; it was visible on the exterior of the 2nd Avenue side of the building, just north of Madison Street. Inside the studio, MINDEN showed pieces that demonstrate the progression of processes over the last six years that led up to the current work. TALMADGE DOYLE had a solo exhibition in Salem in October and November, 2017 at the Governor’s Office as part of Art at the Governor’s Office (State Capitol Building, 900 Court Street NE, 160). TALLMADGE DOYLE had an exhibition titled Pollination at OSU’s Gallery 440 in Corvallis from June 26 through September 6, 2017. This series of hand-pulled prints originates from her studies of the nature and science of pollinators, their migrations and pollination-reliant plant families. From June 2–July 8, 2017 DOYLE’s work was included in an exhibition, Around Oregon Annual, at The Art Center in Corvallis, Oregon. And DOYLE’s work was included in two May–June exhibitions in Roseburg, Oregon: in a regional juried exhibition, Artworks NW, at the Umpqua Arts Association’s Hallie Ford Gallery and in a national juried exhibition, Printmaking Now, at the Association’s Corridor Gallery. Both galleries are located at 1624 W. Harvard Avenue in Roseburg. Augen Gallery participated in the 2017 NCECA Conference in Portland in March with an invitational ceramics exhibition by seven artists, titled Flux Capacitor: Stored Clay Energy. Works featured were by Dan Anderson, John Balistreri, Chris Gustin, Mark Pharis, Jeff Shapiro, Stan Welch and Jeff Whyman. EVA LAKE is participating in two group exhibitions that start in December, 2016. The first is Ten Shades of White at Frosch and Portmann in New York City. The other is Contemporary Prints from Crow’s Shadow at Oregon College of Art and Craft running from December 2, 2016 to January 25, 2017. LAKE’s piece “Sky Over Casino” was selected as the press image for the exhibtion. RITA ROBILLARD’s painting, Cottonwoods of the Palouse, was recently acquired by Washington State University and included in their exhibition, From the Collection: New Acquisitions which ran through July 1, 2016. TRUDE PARKINSON has an exhibition this summer in San Francisco at the Don Soker Gallery. The show opens on July 9, 2016 with a reception from 4–6pm and runs through August 20, 2016. Works by MATT COSBY and CYNTHIA MOSSER (and 7 other artists) were included in a group exhibition titled Transference: A Watercolor Monotype Project With the Patternists, running from March 3 to April 6, 2016 at Portland State University’s Autzen Gallery. The exhibition was sponsored by Mahaffey Fine Art in conjunction with the SGCI Conference (FLUX) at the end of March. Works by HIBIKI MIYAZAKI and DHARMA STRASSER MACCOLL were included in Suddenly Entire: Eleven Artists Draw, an exhibition at the Cannon Gallery of Art at Western Oregon University in Monmouth, Oregon from February 17 to March 18, 2016. A 16-page exhibition catalog is available for purchase. MATT COSBY and CYNTHIA MOSSER were two of eight mid-career artists featured in a Portland Community College Sylvania exhibition titled The Pull of Repetition. The exhibition ran from January 14 to February 13, 2016 at the North View Gallery at PCC’s Sylvania Campus, 12000 SW 49th Ave., CT 214 Building, Portland, OR 97219. JEF GUNN and TRUDE PARKINSON were two of the seven featured artists in an exhibition at Jeffrey Thomas Fine Art in Portland (2219 NW Raleigh) from January 20 to February 27, 2016. The exhibition was titled Visions and Revisions: A Five Year Conversation. On Saturdays from 4–6 pm during this exhibition, the artists hosted public “Conversations with the Artists” with a different topic each week. JAMES MINDEN’s work was part of a group exhibition called Chromatic Momentum in New York City at the Muriel Grépin Gallery showing thru March 5, 2016. The gallery is located at 83 Orchard Street, NY, NY, 347-244-1052. RITA ROBILLARD had a solo exhibition titled Here and There -Timeless Migrations in Tacoma, Washington at the University of Puget Sound’s Kittridge Gallery (in Kittridge Hall at N. 15th and Lawrence). The show was from January 19–February 27, 2016. For more information, see pugetsound.edu/kittredge. SARA SIESTREEM’s weavings were part of the inaugural exhibition at the new Center for Contemporary Native American Art at the Portland Art Museum. The exhibition ran from October 17, 2015 to March 13, 2016. For more info, see portlandartmuseum.org. RITA ROBILLARD’s “Space Dance” was one of 57 prints selected (from 1100 works acquired since 2009) by the Portland Art Museum for an exhibition titled Now on View – Recent Acquisitions of Prints and Drawings. The show ran at PAM from August 8 thru December 13, 2015. TRUDE PARKINSON’s “Emanation” was included in an exhibition titled Mix It Up – Mixed Media in Santa Cruz, CA that runs from August 22 thru September 13, 2015. The exhibition was curated by Andrea Borsuk. GEORGE JOHANSON ‘s painting “Carrying The Boat” graced the cover of The Southern Review – Summer 2015, one of the nation’s leading literary journals, a quarterly published at Louisiana State University. Eight other JOHANSON images illustrated the content of this issue, which focused on the effects of the tropical storm Katrina on New Orleans ten years ago – “The bright beachscapes of GEORGE JOHANSON, a Portland, Oregon-based artist, bring color and community to the pages of the issue.” See more online at thesouthernreview/org/issues/latest. KAREN ESLER’S paintings were included in the recent Pacific Northwest Annual exhibition at the University of Oregon’s Erb Memorial Union Art Gallery in Eugene, OR. 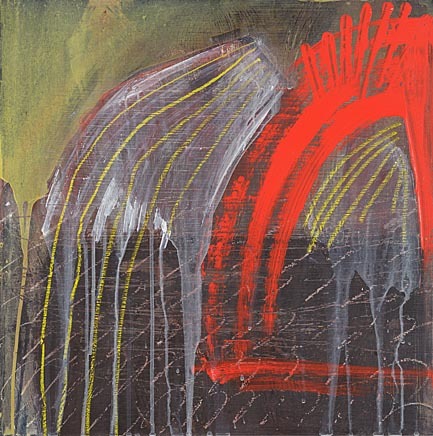 One of her paintings, Hurricane 2, was selected for purchase for the university’s permanent collection. Congratulations to MARK ANDRES whose filmThe Somnambulists, which premiered at Augen Gallery last May, won the award for Best Animated Film at the 2015 Independent Filmakers Showcase in Los Angeles. ANDRES accepted the award in Los Angeles at the IFS Film Festival Red Carpet Event on May 22. For more info, see ifsfilm.com. TRUDE PARKINSON had an exhibition at the Helzer Gallery at the Rock Creek campus of Portland Community College, Portland, Oregon from March 31 to April 30, 2015. MINDEN had a solo exhibition in the summer of 2014 at the Museum of Arts and Sciences in Macon, Georgia (4182 Forsyth Road, 10–5, Tuesday–Saturday; 1–5 Sunday). The museum purchased two of MINDEN’s light drawings for their permanent collection. For more information about this exhibition visit the Museum’s website. MINDEN had an spring exhibition of his holograms titled Toward the Light in New York City at the Muriel Guépin Gallery (83 Orchard St., NY, NY 10002) from April 18 to June 1, 2014 . JAMES FLORSCHUTZ’s work was included in an exhibit at Caldera Arts in Portland (224 NW 13th Avenue) from Sept. 4 to October 29, 2014. The exhibition is artwork produced by resident artists sponsored by the Caldera Ford Foundation. SARA SIESTREEM’s prints was included in a major exhibition at the Eitlejorg Museum of American Indian and Western Art in Indianapolis, Indiana from October 30, 2014 to February 8, 2015. The exhibition showcases 80 prints published at Crow’s Shadow and includes a catalogue. Prints by YUJI HIRATSUKA was honored with a solo exhibition as the 2013 Grand Prize recipient in the Ink, Press, Repeat: National Juried Printmaking and Book Art Exhibition juried by Susan Tallman, Editor in Chief at Art in Print magazine. The exhibition took place at William Patterson University from November 3 to December 12, 2014. GARY GROVES’ work was included in the International Print Center, New York gallery exhibition that starts October 25, 2014 and includes work by 50 artists selected from over 4000 prints by juror Nicola Lopez. The exhibition is titled New Prints 2014/Autumn. Royal Nebeker passed away suddenly September 6, 2014 due to injuries sustained in a fall. Royal’s work was recently exhibited this summer in a career retrospective of his paintings at the Schneider Museum of Art at Southern Oregon University in Ashland, Oregon that will travel to other venues over the next few years. Royal has been represented by Augen Gallery since 1983. He was the first local painter the gallery began to exhibit after expanding beyond exclusively exhibiting prints. Royal recently served on the Oregon Arts Commission and had a long career as a professor at Clatsop Community College in Astoria. He will be missed by a multitude of people in the Northwest art community. See the Daily Astorian for more. YUJI HIRATSUKA had an exhibition of his work titled Works on Paper: Prints, Drawings and Book Arts from September 5 to October 11, 2014 at the Benton County Historical Museum in Philomath, Oregon. Artworks by YUJI HIRATSUKA, GEORGE JOHANSON, HIBIKI MIYAZAKI and MORGAN WALKER were included in Tacoma Art Museum’s (Tacoma, WA) group show titled Ink This! Contemporary Print Arts in the Northwest. The exhibition runs from June 7 through November 9, 2014. ROYAL NEBEKER’s traveling exhibition titled Royal Nebeker: An Artist’s Journey including about 30 of his paintings was in Oregon at the Schneider Museum of Art on the Southern Oregon University campus in Ashland from June 20 to September 14, 2014. Regular museum hours are 10–4 Tuesday through Saturday. For more information about this exhibition, see John Seed’s review of its first solo showing in 2013 at The Brigham Young University Museum of Art in Provo, Utah (June 5 – September 14, 2013), “Life is but a dream…” The Huffington Post www.huffingtonpost.com/john-seed/royal-nebeker_b_3611890.html. A selection of ROYAL NEBEKER’s prints were exhibited from May 5 – 28 at Oregon State University’s Fairbanks Gallery (Fairbanks Hall, 220 SW 26th St.) in Corvallis, Oregon. in the “B” concourse from May 1 to November 1, 2014. JIM RISWOLD’s centerpiece sculpture from his latest exhibition, Art for Oncologists, was on display for a full year (through December 2014) at the Portland Art Museum in the Arlene and Harold Schnizter Center for Northwest Art. The piece is titled “A Big Bowl of Chemotherapies (and one Zofran)” and consists of a 6 x 6 x 2 feet white “candy” bowl filled with ten 15 x 15 x 2 inch white “candy” hearts (made of high-density polurethane resin and autobody paint) that are incised with names of the hopefully life-saving medications that many cancer patients take. The Portland Art Museum is located at 1219 SW Park St., Portland, OR. Hours are 10-5 Tues-Sat and 12-5 Sun. For more info, see portlandartmuseum.org. TALMADGE DOYLE’s prints were included in the Pacific Northwest Annual exhibition at the University of Oregon’s Erb Memorial Union Art Gallery in Eugene, OR from May 2–30. One of her new prints, Cascade III, was selected for a purchase award for their permanent collection. Gallery hours are 8am–10pm Monday through Saturday. HIBIKI MIYAZAKI had a solo exhibition titled Hibiki Miyazaki: 14 Years of Printmaking, in the Governor’s Office at the Oregon State Capitol in Salem from April 24 – June 26, 2014. The exhibition was on the 2nd Floor of the Capitol building, 900 Court Street NE, Salem, OR. TRUDE PARKINSON had a solo exhibition titled Elusives at the Helzer Gallery at Portland Community College’s Rock Creek campus from March 31 – April 30, 2014. The gallery is located in Building 3, 17705 NW Springville Rd., Portland, OR 97229. MATT COSBY had a solo exhibition titled ALUMINUMS and more in March 2014 at the Nidau Gallery in Nidau, Switzerland. Cosby was selected in October 2013 by the Oregon Arts Commission to receive a Career Opportunity Grant to support travel and shipping of artwork to this event. Additional funding came from the Ford Foundation. For more info about the exhibition, see www.nidaugallery.com. JAMES MINDEN had a solo exhibition titled Light Drawings at the Washington County Museum in Hillsboro, Oregon from January 15 to April 6, 2014. Congratulations to BILL BREWER, SALLY CLEVELAND, TRISH GRANTHAM, YUJI HIRATSUKA, GEORGE JOHANSON, JAMES MINDEN and HIBIKI MIYAZAKI who were selected as featured artists in 100 Artists of the Northwest, recently published by Schiffer and edited by E. Ashley Rooney. The book is available on Amazon.com or through the publisher. on Sunday at 6pm and available online after that in the OPB archives. JAMES FLORSCHUTZ was awarded a Ford Foundation Golden Spot Award grant for a two-week sculpture residency at Caldera (near Sisters, OR) in April, 2014. FLORSCHUTZ had a solo exhibition of his larger sculptural works at Wyden and Kennedy’s Portland gallery in July of 2013. In October, 2012 his work was included in a group exhibition called Still at Archer Gallery at Clark College in Vancouver, Washington. SARA SIESTREEM’s work was part of the Crow’s Shadow Institute of the Arts Biennial at the Hallie Ford Museum of Art at Willamette University in Salem, Oregon from November 9, 2013 to February 2, 2014. The exhibition featured contemporary prints created at Crow’s Shadow Institute of the Arts on the Umatilla Reservation in northeastern Oregon during the past two years. SARA SIESTREEM had a solo exhibition of her paintings at the Missoula Art Museum in Missoula, Montana from September 6, 2013 to January 26, 2014. The exhibition was titled Sara Siestreem: Ballast and included over 20 paintings. The exhibition was in the Lynda M. Frost Contemporary American Indian Art Gallery at the museum, a gallery dedicated to honoring the creative cultural contributions of American Indian people to contemporary art. YUJI HIRATSUKA had an exhibition at the Chehalem Cultural Center in Newberg, Oregon from August 28-Septemer 21, 2013. MARK ANDRES’s film, The Immortal Head, was awarded BEST ANIMATION at the 16th Annual Independent Filmmaker’s Showcase film festival in Los Angeles, CA. Film screenings were held from March 27 – April 8, 2013 in Los Angeles and Beverly Hills. For more info, see ifsfilm.com. 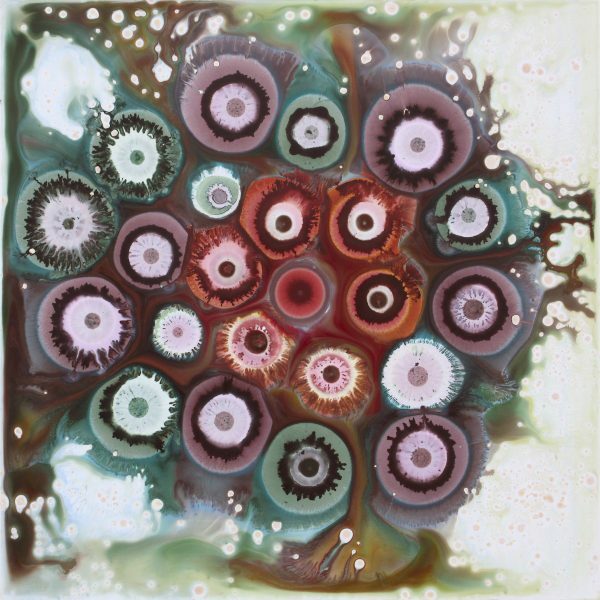 JEF GUNN’s encaustic work was included in an exhibition titled Waxing Poetic: Five Oregon Artists Working With Encaustics at OSU’s Memorial Union Concourse Gallery in Corvallis, OR. from March 11 to May 8, 2013. The exhibition was curated by Shelly Jordon and Nicole Hernandez. The Book of Sand, published by Nawakum Press in California, is a beautiful artbook with a short story by Jorge Luis Borges and etchings by THOMAS WOOD. The book is available at www.nawakumpress.com. TALLMADGE DOYLE’s work was included in the 34th Bradley International Print and Drawing Exhibition from March 9 – April 19, 2013 at the Hartman Gallery at Bradley University in Peoria, Illinois. The exhibition was juried by Stephan Goddard, senior curator at the University of Kansas’ Kress Foundation. EUNICE KIM represented the United States in the International Print Triennial – Krakow 2012, held at the Contemporary Art Gallery Bunkier Sztuki in Krakow, Poland. The exhibit was on view from Sept. 15 through Oct. 3, 2012. This exhibition is widely regarded as one of the most prominent and influential events in contemporary printmaking. See more online at: http://www.nwasianweekly.com/2012/11/seattle-artist-represents-us-at-international-art-show/. TALLMADGE DOYLE was featured on Oregon ARTBEAT (on OPB-TV, Channel 10) on Thursday, November 1, 2012. (The episode is available in the show’s archives.) DOYLE exhibited work at several locations in the fall of 2012 including Hilo, Hawaii and Palo Alto, CA. Her work is in the Pacific State Biennial National Dec. 3 – April 30 at the Center Gallery, University of Hawaii at Hilo, juried by Karen Kunc. From Nov. 2 – 30, her work was included in Pressing Matters National Printmaking Exhibition at Pacific Art League Gallery in Palo Alto, CA, juried by Crown Point Press’ Valerie Wade. EUNICE KIM was a recipient of a 2012 Individual Artist Projects Grant from 4Culture, cultural services agency for King County, Washington. From 295 applications submitted and reviewed, 66 artists working across disciplines in visual arts, literature, music, media, dance, and theater were selected to receive total of $333,000 in funds. KIM will use the award to support creation of new works using a sustainable, nontoxic printmaking technique she developed that is specific to her visual language and utilizes safety-conscious methods. SARAH ELLEN TAYLOR’s first British solo exhibition titled lux took place at Natterjacks Art Gallery – Sefton House www.seftonhouse.co.uk – from June 20 – July 28, 2012 – with an opening party with the artist on Wednesday, June 20th from 5-8pm. More of her new paintings can be viewed on Natterjacks facebook page.Three artworks by TAYLOR are featured in the current issue (Issue 10) of Pushing Out the Boat , a British journal of art and literature published in Edinburgh, Scotland. WENDY FRANKLUND MILLER’s work was included in a group show at Anchor Art Space in Anacortes, Washington titled “Extended Outlook” from Friday, June 1, 2012 throughl July 15. The exhibition was curated by writer, critic and artist Ron Glowen. For more info, see anchorartspace.org. JONNEL COVAULT was featured on OPB’s ARTBEAT on April 5, 2012 at 8pm, repeating on Sunday, April 8 at 6pm (Channel 10) and available in the OPB online archives after that (http://www.opb.org/artsandlife/arts/article/slideshow-jonnel-covaults-willamette-river-series/). LORI-ANN LATREMOUILLE had a new CD release in 2012 titled “Deep Water” – also the title of her new painting pictured on the CD cover. (Over the past three years Latremouille has transitioned from charcoal drawing on paper to acrylic painting on wood panel.) Songs on the new CD are written and performed by Latremouille and arranged, produced and recorded by David Kershaw (keyboard player for Sarah McLachlan). The CD is available from CDBaby. For more info, see www.wix.com/latremouille/deepwater. In December 2011 RITA ROBILLARD received the honor of a Ford Foundation Grant given to an artist-in-residence at the Sitka Center for Art and Ecology. She was invited to extend her stay at Sitka through the end of January, 2012. YUJI HIRATSUKA’s work recently was included in the 16th Space International Print Biennale in 2012 at the OCI Museum of Art in Seoul, South Korea (winning the Excellent Prize) and was included in October 2011 in an exhibition of the Tolman Collection in Tokoyo, Japan. Portland’s Richard Speer wrote a review of HIRATSUKA’s work for ArtNews (March, 2011); see richardspeer.com/artnewshiratsuka.html. Also, HIRATSUKA was featured on Oregon ART BEAT on Thursday, Oct. 13th, 2011, Channel 10, OPB. If you missed it, Art Beat episodes are viewable online at OPB. TALMADGE DOYLE’s latest public artwork was installed at the Ford Alumni Center on the University of Oregon campus in Eugene, along with work of two other artists (Rick Bartow and Lucinda Parker) selected for the center. Doyle’s project consists of 21 etched and colored copper plates depicting the flora and fauna of Oregon. These plates surround a fireplace in the central area of the Alumni Center. Prints will be made from some of the plates. The Ford Alumni Center is open during regular business hours and an official celebration and art opening will be held during the last week of September 2011. TRUDE PARKINSON will be featured (again) on the televised April 7 edition of Oregon Art Beat at 8pm on OPB, Channel 10 (coordinating nicely with her April 2011 exhibition at Augen in the Desoto Building). This is a rerun of an earlier show and it will repeat on Sunday, April 10 at 6pm and can be accessed anytime from the archives of OPB’s website ((opb.org/programs/artbeat/). MORGAN WALKER participated in every aspect of costume design, including hand-selecting the fabrics and appearing onstage at the opening, for Oregon Ballet Theatre’s 2011 production called The Stravinsky Project. The ballet was performed at Keller Auditorium in Portland in February and early March. WALKER says the experience has inspired some new paintings. For more information, see the illustrated Oregonian article by Grant Butler. As part of the 2011 Boston Cyberarts Festival, MARK WILSON’s artwork is currently included in an exhibition of works called Drawing With Code: Works from the Anne & Michael Spalter Collection at Foster Galleries in Boston. The exhibition continues through April 24, 2011. WILSON’s artwork also graces the covers and some of the pages of a new book, Digital Pioneers, by Honor Beddard and Doug Dodds about the Victoria & Albert Museum collection of computer art. HIBIKI MIYAZAKI participated in an artist’s residency in the fall of 2010 in Delhi, India where she produced a new body of large-scale paintings on paper. Her residency took place from Nov. 2- Dec. 25, 2010 at the Sanskriti Foundation in Delhi. The Oregon Arts Commission provided a grant to help cover her expenses. GARY GROVES’ work “Eastern Washington” was selected by the International Print Center New York for New Prints 2010/Autumn, curated by Jennifer McGregor, opened Oct. 21 and continued through Nov. 20 in New York (and then traveling to the University of Texas at Austin Jan. 28 – March 12, 2011). For more information, see ipcny.org. In Chicago, several GROVES’ prints were selected for The Color of Black & White, an exhibition at Kavi Gupta Gallery that ran from Sept. 10 – Oct. 16, 2010. This exhibition was curated by CHRIS JOHANSON. For more information, see kavigupta.com. Fall 2010 was a great season to see GEORGE JOHANSON’s artwork in Portland. From Sept. 30 – Oct. 27 his work was included in Marylhurst Art Gym’s 30th Anniversary Celebration. Next, Oregon Public Broadcasting aired a segment on JOHANSON’s work on October 7 on Art Beat. (The show is available for viewing in the OPB archives.) A major retrospective of his paintings opened on Friday, October 8 at PNCA (Swigert Commons) at 6:30 pm with a lecture by Johanson. The exhibition, titled Seven Decades, was accompanied by a 35-page catalogue of his work.